Here is some pretty interesting footage from our 2018 Interclub Regatta. The crash at 5:00 is scary and a teachable moment. Situational awareness is paramount in avoiding potentially life threatening crashes like this one. Think about this the next time you find yourself crowding someone on the line in heavy traffic. 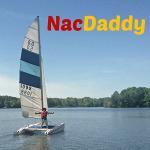 My Nacra 5.0, sail #967 appears in the footage a couple of times. Looks like the couple on the H16 had a few other close calls and are lucky that they didn't hit any other boats. I would imagine that they had a few spirited conversations when they got back to the beach. Sail fast, but sail responsibly. Thanks for sharing. Looked like a pretty clear cut case of port vs starboard with the monohull being on port. Hobie attempted to duck to avoid the collision but mis-judged the speed of the mono slightly. The issue primarily stems from having boats with such a vast speed and maneuverability difference racing on the same course. Not so much of a problem when everyone is on the same type of boat, but when you have one boat capable of goint 2-3 times faster than another, people have a hard time judging crossings and other near-boat interactions. I think the Hobie did the right thing in this case, he just should have left another foot or two between the stern of the mono. We also don’t know what was going on to leeward of the Hobie - may not have been enough room to bear off farther. martyr Looks like the couple on the H16 had a few other close calls and are lucky that they didn't hit any other boats. I would imagine that they had a few spirited conversations when they got back to the beach. Sail fast, but sail responsibly. Thanks for sharing. The H16 was on starboard tack while everyone they "dodged" was on port tack. The H16 had the right of way and the monohulls should have given way, tacked whatever such that it didn't have to alter course. Unfortunately there was an actual collision as I point out in the video. That mono was on the opposing team and didn't take a penalty turn as they should have. Nothing was said by anyone to anyone after the regatta as the incident didn't result in injury to people, damage (other than a small scratch on the mono) to equipment or change the outcome of the regatta. One variable of many being slightly different and the day would have ended much differently with folks in the emergency room and smashed boats. SCARY!!! Dogboy The issue primarily stems from having boats with such a vast speed and maneuverability difference racing on the same course. True and welcome to mixed fleet racing! The problem is exacerbated by the vastly differing experience levels in our club's fleet. Someone around even a few seasons will be very keen to hearing "STARBOARD" while newbies often become a deer in headlights and will drive right in to another boat. The only way I've found to help the situation (with a combine mono/multi start) is to request a generous starting line length affording space to bug out if necessary. The angle of video doesn't show what the other boat was doing prior to the contact. That said, Rule 14 does say that "A boat shall avoid contact with another boat if reasonably possible." Yes, there are two qualifiers on that rule but the primary obligation of every boat is to avoid contact. Depending on circumstance, both boats could have been penalized but for different rule violations. If the mixed fleet racing is a bunch of monohulls allowing a few multis to play with them, my recommendation to the multis is be conservative around the other boats so you get invited back. I find that most mishaps on the race course happen because folks are not good sailors rather than not good racers. In our mixed fleet, racing is mostly friendly and an exercise in learning as much as competition. I'll take the friendly stuff any day. dssaak The angle of video doesn't show what the other boat was doing prior to the contact. That said, Rule 14 does say that "A boat shall avoid contact with another boat if reasonably possible." Yes, there are two qualifiers on that rule but the primary obligation of every boat is to avoid contact. Depending on circumstance, both boats could have been penalized but for different rule violations. All subject to the RC and protest committee on duty at the time and their interpretation of "reasonably possible." dssaak If the mixed fleet racing is a bunch of monohulls allowing a few multis to play with them, my recommendation to the multis is be conservative around the other boats so you get invited back. OHSC does not differentiate between members favoring one type of boat over another there is no "allowing." Interestingly, we are at a tipping point of multis outnumbering monos.